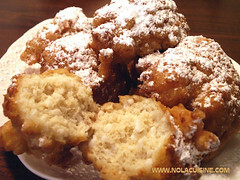 I made Calas today with some leftover rice on my site Nola Cuisine. I have to tell you, this batch really gave Beignets a run for their money, and I love Beignets. Be sure and check out my ever growing Index of Creole & Cajun Recipes at Nola Cuisine.